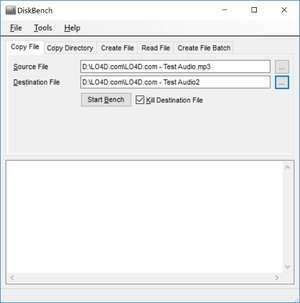 DiskBench is a free utility to benchmark storage medium such as hard drives, network devices, USB thumb drives or virtually any device you connect to your PC. The application layout is perfectly simple and provides a quick and dirty way to see how fast your storage device can copy files. All that is required is a file to test (preferably larger) and a directory to save it to; it can be immediately deleted after the test has been completed. Overall, DiskBench is a useful and small utility to test speed. Version 2.7.0.1 is a freeware program which does not have restrictions and it's free so it doesn't cost anything. For security reasons, you should also check out the DiskBench download at LO4D.com which includes virus and malware tests. Additional screenshots of this application download may be available, too.